DAVE – Success in the NFL can be fleeting. Yet, it seems that every year pundits and prognosticators trot out last year’s best when forecasting this year’s best. We know it doesn’t work like that. Every year, you can figure that about half the playoff teams will turn over. Week One is our first chance to see who might be this year’s surprises, and who might be this year’s flops. 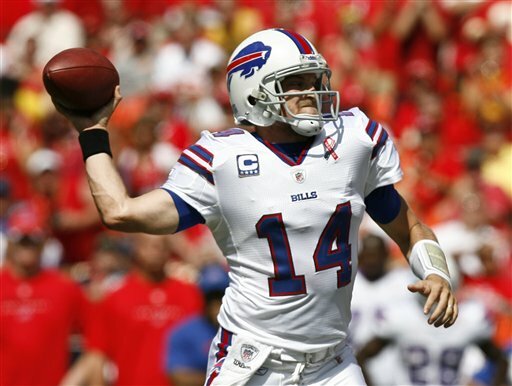 To that end, on both counts, Buffalo’s 41-7 win over the Chiefs may have been Sunday’s most interesting morsel to me. It was interesting to see Houston and San Francisco shine, while the Falcons and Steelers struggled. It’s a long season, but Week 1 likely provided some clues for who this year’s surprises will be. CARA – At NFL Films, the first week of the football season reminds me of the first day back at school. Everyone has a crisp, new wardrobe …of the newest player jerseys. The hallways, like the machines in our film lab, are humming. Everyone gathers to share stories, not of their summer vacation, but of yesterday’s games. We’re just a bit drowsy as we try to adjust to the schedule, but energized nonetheless. On our desks, our pencils are sharpened and arranged neatly next to our textbooks (2011 NFL Records & Facts). We wait patiently for the teacher to arrive – in this case, NFL Films footage. Welcome back, football season. TIFF – Week 1 in the NFL is always a spectacle. After months of anticipation, fans are ready to devote 10 hours of their day glued to their television sets. But this weekend was more memorable than others… Not just because of the crazy upsets and stunning performances, but because of the opening ceremonies. 9/11 was the most devastating event to happen in my lifetime, and 10 years after the tragedy, I thought the NFL paid proper tribute to the anniversary. 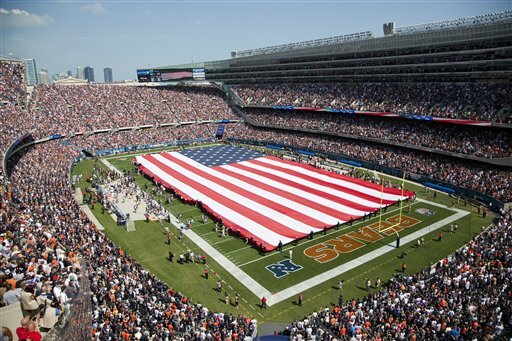 With everything from the large American flags that unfurled on fields to players wearing red, white, and blue gloves and shoes, the NFL demonstrated the importance of America to football. NICK – Section 146 at MetLife Stadium last night got very rowdy early on. The Cowboys, being America’s team, had tremendous fan support during a game in which we celebrated America. I don’t remember any Jets game with more fans from the opposing team present, making for some interesting interaction. While Dallas was all over the Jets early it was hard to sit there and take abuse from the Cowboys fans. But in the end, we Jets fans had the last laugh. Joe McKnight’s blocked punt sent the crowd into a frenzy that was like none I’ve ever heard at the new stadium. The home fans got to rejoice again later thanks to Tony Romo’s blunders. However, every fan in the stadium cheered together in unison throughout the night as J-E-T-S took a back seat to U-S-A.